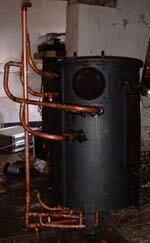 These pages are about creation of the Stovesonline experimental wood gas stove. 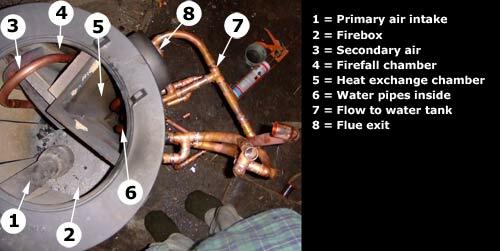 This stove is only a proof of concept stove, not the finished product. To make matters simple I took one of our Greenheart workshop stoves and modified it. This was much simpler than making the stove body from scratch. Our Greenheart workshop stoves can burn a variety of wood fuels from logs down to woodchips, pellets, and even shavings and sawdust. They can do this because there is a tube descending into the firebox that supplies the primary air to the fire. Loading a normal stove with sawdust or woodchip would put it out or make it smoulder, but because of this air supply tube the workshop stove keeps working. Inside the stove I made 2 extra compartments. The first compartment (the firefall or flamefall compartment) is where a fresh supply of air is introduced to the wood gases to encourage complete combustion. This compartment is well insulated, as is the firebox, which means that the temperatures should get pretty high at the bottom of this compartment. In the first video you can see the stove in action before the water pipes were fitted. You can see inside the top of the stove into the firebox where wood is burning. The stove has just been started and is not yet up to temperature. You then look through the window on the side of the chamber and see the wood gases starting to ignite. Next you see the stove up to temperature and the wood gases burning fiercely in the chamber. In the next video clip you can see the stove in action with the water pipes fitted. As you can see the wood gases are burning well in the chamber. A closer shot shows the wood gases burning in the firefall chamber which is glowing red at this point. The seems to transfer well to the water as the flow from the stove is too hot to touch! This is an experimental stove. Please do not try this at home, only install a stove if you are an experienced installer, only connect to central heating if you are a registered heating engineer.